So, this is my 200 post according to WordPress. Is there a better way to celebrate it than wearing one of my favorite skirts, my current favorite blouse, my favorite boots, and the love of my life colored tights! However, as it is getting pretty late in the evening here, I gonna keep it short today, and I want to save all the good points about this outfit for a series of posts about how to dress for a curvy body. But it will have to wait until I have submitted all the grant applications. And since I need to continue that work tomorrow, I probably need to go to bed now. By the way, believe it or not these photos were taken at 8 am, and it was almost as dark as it looks in the pictures, but not as cold as it looks. I am linking up to Visible Monday at Not Dead Yet Style hosted by the stylish Patti! 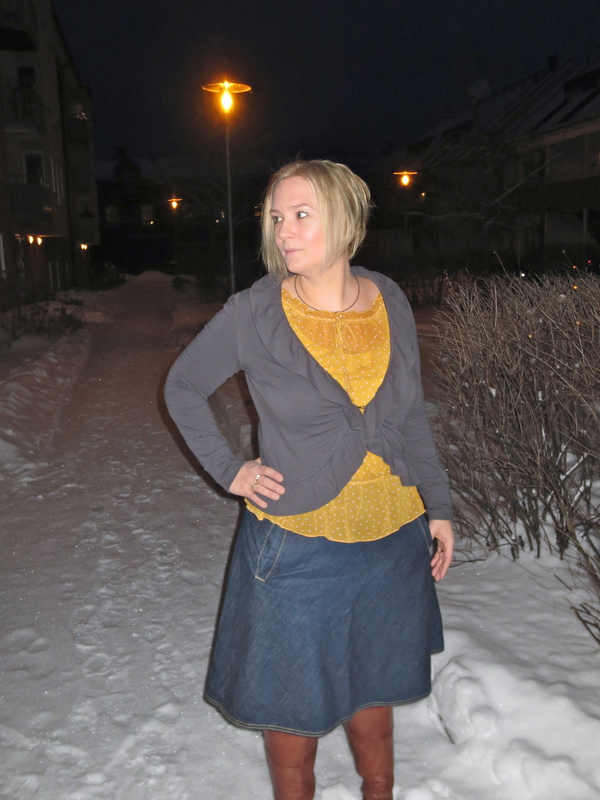 This entry was posted in Stylish winter outfits, What to wear in the office winter time and tagged blouse, Boots, Cardigan, curvy body, denim, denim skirt, grey, mustard, snow, style, winter. Bookmark the permalink. 37 Responses to 200 posts!!!!! I love all of the colors in this outfit. It looks great on you. Happy 200! The boots are great, Anna. Your ruffled cardigan is really pretty too. It does look very cold! I really like the street lamps in the background; the whole backdrop to your picture is simply lovely. Thank you Lisa! Our courtyard actually look nicer with snow than without snow. The strange thing with the snow is if it is not wind the snow makes the air feel a little warmer than if there would not had been any snow. But that is my opinion. Congrats! Love that gold colored top. So pretty. Thank you Marla! I love the top very much too, maybe it is good that I have to wash it regularly otherwise there would not be any new outfits to post! Jean, what do you have to offer instead? I take anything that includes sun, but if you have rain I gonna stick with the snow 😉 Thanks for dropping by! 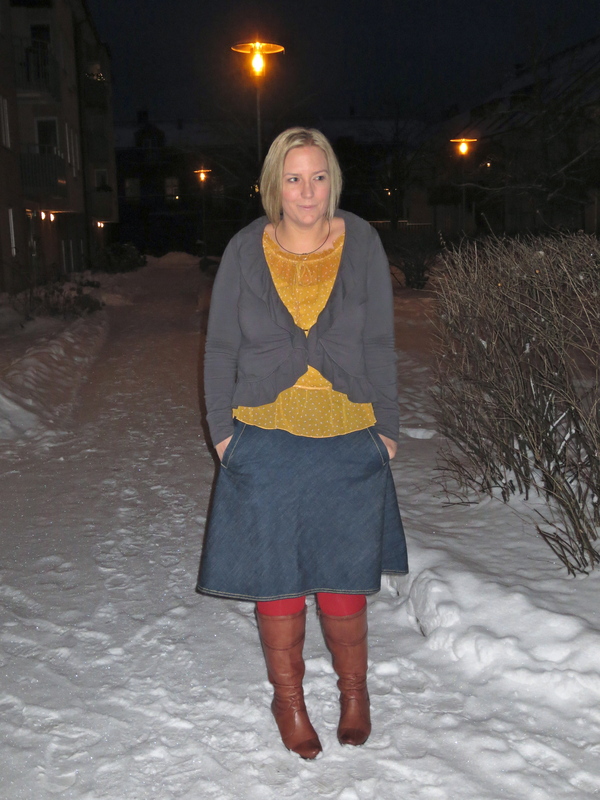 Love these colors, Anna — stay warm my stylish friend! Thanks for linking up to Visible Monday. Thank you so much Patti! You do know that you host the most friendly blog party on the web, don’t you? Thank you Rachel! It means a lot to get this comments from the queen of bright color mixing! As I say, more color to the people! Congrats! And there is nothing better than a denim skirt! Congrats on 200 posts…it is good to mark blogging milestones. You are doing a great job!! Thank you so much Pam! Your comments always cheers me up! love the color block – congrats on 200! Lovely colors you’ve got going here! I love your sweater! Have one very similar in style and color. 200 posts is monumental. Congrats! My dear Anna! I can see why these are your favorites. 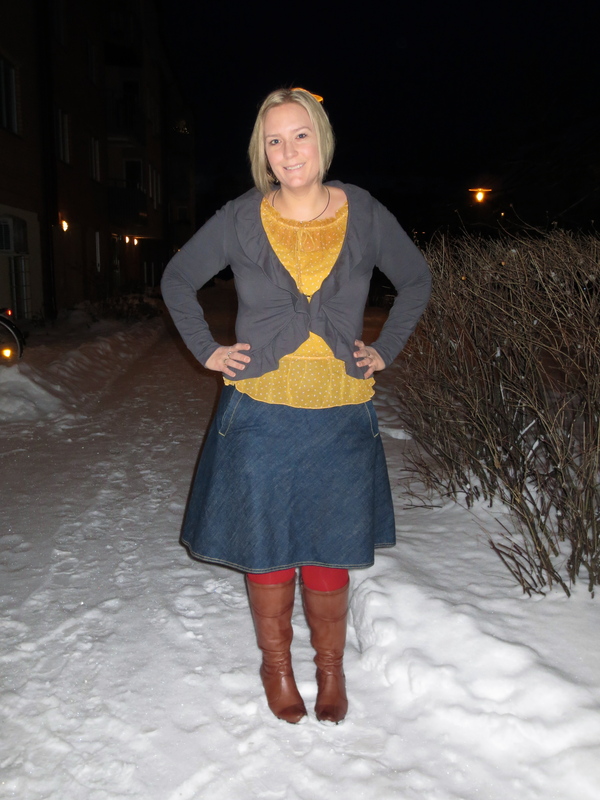 The mustard top is amazing and also the denim skirt. I love the grey cardigan with the ruffles, it is so feminine and works so well with the other parts. You look so fabulous! It was such a nice break to read everyone’s lovely comment after a loooong day at work! The best part of the outfit is the red tights peaking out from under your skirt. Very pretty outfit! Thank you Debbie! Red cheers up most outfits I think. I agree with Debbi, the best part of your outfit are those amazing red tights, they bring your entire outfit to a whole new level, great choice! But I should add the mustard shirt looks great with your cardigan, really your whole outfit is just all around cute. Thank you Trina, I agree the tights makes a difference! I love primaries with gray(s) … especially when they end up looking cute together. I’m wrestling with the color of tights to go *with* a red sheath this week … thanks for the hint. Have a great week in spite of the snow! Thank you Jan, I hope you will post some photos. Ohhh… it is very cold, but that give me an excuse to stay inside and work on my grant applications instead. Thank you Sarah! Then we have something more in common, except both of being style bloggers, polka dots and sheer fabric are my absolute favorite items (and denim skirts and colored tights). Actually, it is not polka dots on the blouse, but small little flowers, but it does not show. Flowers are fine too! Dear Anna, congratulations! Very well done! You look great in this outfit, I can see that you love wearing it. Grey and mustard are beautiful colours on you. It does look as if Sweden isn’t as cold as Denmark these days – damn that wind! Do you have snow enough for skiing? Or just for a game of throwing snow balls? Thank you Tine! It is actually very cold, although it was not that cold when these photos were taken. I also suppose that the extra isolation I have achieved the last months makes me freeze less 😉 It is actually pretty much snow, but since I have been sitting on my bump most of the time this month writing grant applications, I have not been able to enjoy the good sides of the winter very much! First off, congratulations on two hundred posts, that really takes quite a bit of time and dedication to get to that mark. I wanted to say thank you so much for you sweet comment over on my blog and how fun it is to see another cold climate gal in the style blogging community! (It can be a challenge trying to dress cute in the cold weather with all of the snow and the uncute layers of clothes it takes to stay warm.) You have such an adorable sense of style and I love how you play with bright colors, the yellow blouse with your red tights is so fun and really perfect for winter time.